Chloe Capital is searching for the best, investment-ready innovation companies in the country. We’re offering investors an opportunity to ‘do well and do good’ by supporting women entrepreneurs on our National Tour! The countdown is on for startups, investors and sponsors to take action. 25 women leaders will pitch their ventures. Five will receive funding from Chloe Capital, plus the opportunity to pitch our network of co-investors. Investor capital will be de-risked across the five investments. 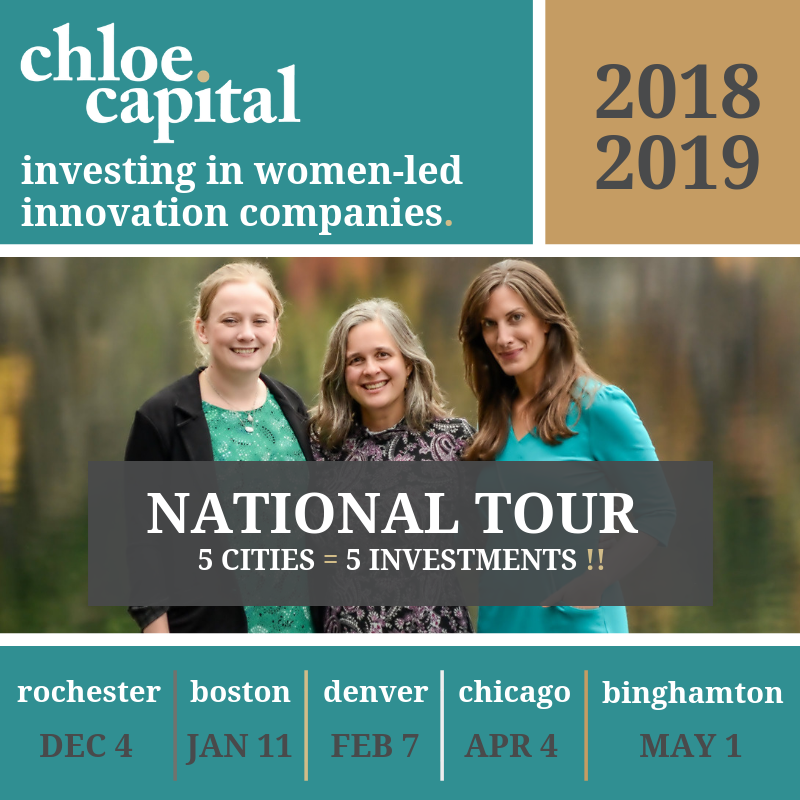 Chloe Capital is a seed-stage venture capital firm that invests in women-led innovation companies. We focus on frontier technologies in rapidly growing markets, and seek diverse leadership teams. Companies do not need to be located in these cities to pitch or receive an investment. However, if selected, be prepared to travel. Meeting our investors in person is a must! Fueled by the success of our inaugural Women’s Investor Accelerator, Chloe Capital in partnership with our City Champions, will hold unique and exclusive workshops for investors. All levels of experience welcome. You’ll gain insight and inspiration from the top leaders in venture capital and angel investing, tap into a network of your peers and benefit from a hands-on investing experience. Help Chloe Capital decrease the gender gap in entrepreneurship by providing women-led companies access to more capital.